Our Gothic Medieval Style Jumbo FAKE LOCK WITH ASSORTED KEYS ACCESSORY will complete your criminal themed Halloween steampunk cosplay jailor prison costume. Features hollow hard plastic black and silver fake lock with four assorted size keys. Hang or display in many different ways for any zombie prisoner, punk biker costume or haunted house dungeon prop building yard decoration. Large size lock approx. 4-inch (6.25cm) Long x 2.75-inch (6.88cm) Wide x 0.75-inch (1.88cm) Deep. Realistic industrial style fake lock and keys makes for an extra creepy prop building accessory for any dungeon, torture chamber, haunted house swag, fence garland, cemetery graveyard border, crypt decor or pirate party scene! Includes antique look rustic fake silver and black plastic lock embellished with classic swash-buckling pirate style crossed swords and skull, with plastic keys that can hang from fences, doors and chains for an even more realistic medieval look. Hard hollow plastic non-functioning faux lock and 4-assorted size fake keys. 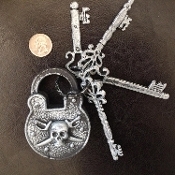 -Antiqued silver-tone molded lock and removable keys.